Upgrade accommodation subject to availability at the time of booking. We're excited to offer this amazing five day extensive tour full of hiking, swimming, wildlife and exploring Tassie's spectacular national parks. Starting in Launceston we visit the Cradle Mountain, Bay of Fires, Wineglass Bay, see fairy penguins, meet a Tasmanian Devil at the wildlife sanctuary. We'll also stay in amazing lodges, eat good food and make new friends. We leave Hobart and drive through the Derwent Valley – travelling east to west across the island.You’ll see the beautiful Russell Falls, walk among the Mt Field National Park Tall Trees, and visitAustralia’s deepest freshwater lake, Lake St Clair. Explore the pristine Franklin-Gordon Wild RiverNational Park and end the day in Strahan. In the untouched wilderness of Tasmania’s West Coast we will explore the shifting sands of HentyDunes. Then we continue into the Tarkine Rainforest and walk to Tasmania’s highest waterfall –Montezuma Falls. 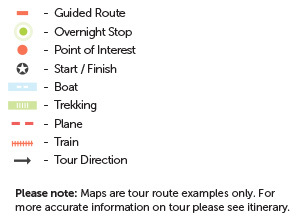 Or you can choose to join the world famous Gordon River Cruise (optional, at yourown expense). Around 950m above sea level is the World Heritage listed Cradle Mountain-Lake St Claire NationalPark, where you choose a walk to suit you. With an extensive range of tracks, stroll around DoveLake or challenge yourself with a hike to Marion’s Lookout. A short drive takes us through Sheffield,the ‘town of murals’, to Launceston. There are opportunities to purchase lunch, dinner and snacks during the tour. Note: Itineraries may vary for reasons such as seasonal conditions, weather extremes or Traditional Owner and national park requirements. See terms and conditions for more information. 4 nights hostel style accommodation with shared facilities. Upgrades available.